Cardiff and Vale University Health Board (UHB) is working together with Cardiff University, BRAIN and CUBRIC to deliver a first in man trial of a “gene-silencing drug” for Huntington’s Disease. Huntington’s Disease (HD) is an inherited, progressive, neurodegenerative condition affecting approximately 300 families in South and South West Wales. HD is caused by patients inheriting a faulty gene (HTT), which leads to the production of a toxic protein called mutant huntingtin. Mutant huntingtin protein causes neurodegeneration by slowly poisoning specific groups of brain cells, leading to gradual dysfunction and decline in motor skills, cognitive abilities and behaviour over a twenty year period. There is a 50% risk of inheriting HD from an affected parent. Average age of onset is variable, usually between 30-50 years old. The devastating effect of this disease significantly impacts on the quality of life of both the patient and their family. At present there are no disease modifying therapies available. In 2015, IONIS Pharmaceuticals launched the first ever trial of a huntingtin-lowering drug. Cardiff and Vale UHB was approved to join this study in March 2017; the only centre in Wales to participate. St. Mary’s Pharmaceutical Unit in Llanishen were involved in the drug preparation and secure transportation to the University Hospital of Wales, so that the trial could be administered within the Neurosciences Research Unit (NRU), a dedicated research facility, embedded within the Neurology ward on C4. Target recruitment for this early phase trial was 46 participants globally, two were successfully recruited from the South Wales Huntington’s Disease Service in Cardiff University. Participants were required to attend regular appointments at the NRU for EEGs, blood samples, ECGs, cognitive and physical assessments. 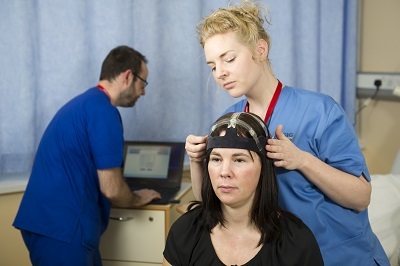 A key success to this study was having access to MRI scanning facilities at Cardiff University Brain Imaging Centre (CUBRIC) who helped to manage this core part of the trial. This clinical trial, led by Professor Anne Rosser and Dr Tom Massey, used a lumbar puncture to inject the drug into the cerebrospinal fluid, the fluid that surrounds the brain, and observed that the drug led to a decrease in the levels of huntingtin in the brain. Rebecca Cousins, Lead Nurse for the trial said: “This trial has set a number of firsts for Huntington’s Disease; the first in man study for ISI443139, the first intrathecal delivery of this drug in HD and the first multiple ascending dose study in Huntington’s Disease. “Through our participation and dedicated multidisciplinary approach we’ve set a precedent for clinical trials in Neurosciences research; in Cardiff and in Wales. “We had strict timelines; Cardiff joined the study at the end of March and had to enrol two participants by the end of April. “Coordination and management of such a complex study, involving a range of resources within Cardiff, was challenging. “It was through our focused approach that we were able to safely meet the study’s main objectives. “Moving forward, we will be participating in an extension of this study, which should give us a clearer indication of the effects of this drug long term.